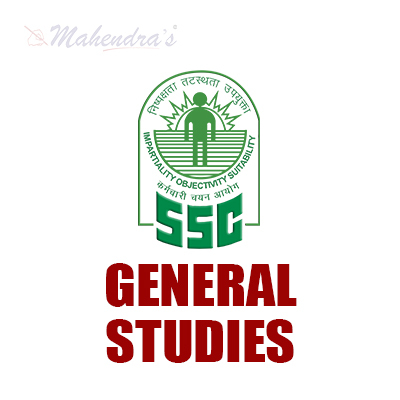 General Studies can be one of most scoring and marks gaining section in the SSC exam. This section doesn’t require any calculations and is thus the least time-consuming section, unlike other section. You can attempt this section very quickly and accurately. General Studies basically judge your basic general knowledge and how you are getting yourself updated time to time. It plays a vital role and benefits you to achieving the score required to cross the total cut off marks. Mahendra Guru providing you with an important General Studies quiz for SSC exam, it will help you to score if you regularly follow the contents of our website. We also provide you General Studies Quiz for SSC examination based on the latest pattern.So, that you can practice on regular basis. It will definitely help you to score good marks in the exam. It is the most important section for all the govt exam Insurance, SSC-MTS, CGL, CHSL, State Level and other Competitive exams. You can clear your doubts before an exam. Mahendra Guru also provides you with an important note and study material for all subject and test through its website, Mahendra Guru App and YouTube channel apart from it Speed Test Portal. Most of these preparation products are also available for purchase at my shop. You can also visit Mahendras.org to get more information about our endeavour for your success. You can also study in details through our E-Mahendras Facebook and Mahendra Guru YouTube channel of General Studies. Q1 How many nationalized banks are there in India? Q1 भारत में कितने राष्ट्रीयकृत बैंक हैं? Q2 Amir Khusro was the court poet of which ruler? Q2 अमीर खुसरो किस शासक के दरबारी कवि थे? Q3 Where was the birth of Mahavir Swami? Q3 महावीर स्वामी का जन्म कहाँ हुआ था? Q4 "Kuchipudi" is the dance form of which state? Q4 "कुचिपुड़ी" किस राज्य की नृत्य शैली है? Q6 Which instrument did Ustad Bismillah Khan played? Q6 उस्ताद बिस्मिल्ला खान किस वाधयंत्र को बजाते थे? Q7 What is the full form of CAD? Q7 CAD का पूर्ण रूप क्या है? Q8 Who said, 'Give me blood, I will give you freedom'? Q8 किसने कहा था, 'तुम मुझे खून दो, मैं तुम्हें आजादी दूंगा'? Q9 What is the script for which period is called pictorial script? Q9 किस काल की लिपि को चित्राकार लिपि कहा जाता है? Q10 What was the language of Chola rulers? Q10 चोल शासकों की भाषा क्या थी?